Department: Corporate Leadership/C.F.O & C.O.O. Angie has been married to her husband, Rick, for 20 years and has three beautiful stepchildren: Trista, Nathan (wife Caty), and Justin. Angie’s hobbies include camping, walking, and spending time at the beach. She also enjoys traveling in her spare time with Rick and their two Yorkie pups named Milo and Millie. 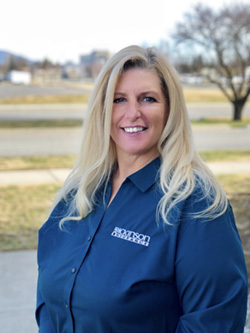 Angie has been part of the Dickinson Insurance team for the past 21 years and has experience in all departments. Angie is now a partner of the agency and serves as the C.F.O./C.O.O. She enjoys working at a company that helps customers, serves the community, and brings positive change to the industry. Angie’s Claim to Fame: She was born on a military base in Germany and would have been born in an unauthorized part of the country had her parents not rushed to the base!